When you live in Texas, having an air conditioner that works like it should isn’t a luxury; it’s an absolute necessity. As the temperatures climb, living without a good cooling system could be dangerous to your health. At Lightfoot Mechanical, we offer expert air conditioning installation and maintenance in Fort Worth and the surrounding areas, and our friendly technicians are always available to help you and your family stay cool and comfortable all summer long. Whether you are investing in your first cooling system or thinking about replacing your existing one with a newer, more efficient model, choosing the right one is crucial. Air conditioners come in a wide range of sizes, and having the wrong size installed sets you up for several years of problems. A system that is too small will have to work harder to cool your home, resulting in premature breakdowns and frequent repairs. Needing to run constantly will also drive up your electric bill, and your home may never be as comfortable as you’d like. If you think purchasing an oversized system is a better idea, think again. Oversized air conditioners cycle on and off frequently, resulting in high electric bills and excess wear and tear on the system’s components. When it comes to cooling your home effectively and efficiently, you need to purchase an air conditioner that is properly sized for your home. At Lightfoot Mechanical, our HVAC technicians are trained to measure your home and help you choose the system that’s just right. Even top-of-the-line ACs require a bit of TLC from time to time. Keeping up with routine air conditioner maintenance is the best way to avoid problems and ensure that your system won’t break down when you need it most. From replacing filters to cleaning ducts and inspecting components for damage, we offer comprehensive air conditioning maintenance services to keep your system running like it should. When you need expert air conditioning installation and maintenance in Fort Worth, look no further than Lightfoot Mechanical. 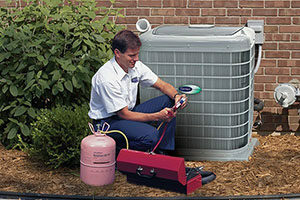 Our technicians are highly trained, and we make sure they are equipped to tackle any AC project. To schedule an appointment, please give us a call now at 817-596-0309.